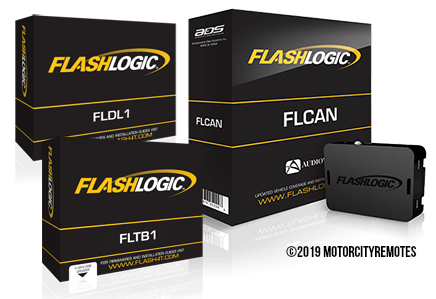 The 3 Best Flashlogic Bypass Interface Kits in the Industry! Not sure which bypass kit is right for your specific installation? Call or Email us and one of our tech's will be happy to help! Q: Will the FLTB1 work with my remote start system? Vehicle specific, combination (2-In-1 Kit) data transponder key�bypass and doorlocks interface module programmable for over 1200 different year, makes & model of vehicles. Features include pre-flashed vehicle specfic firmware and single-wire connection to any remote start system�equipped with a 'DBI' port (also compatible to any remote starter system�without a DBI port but�with a negative active out�during remote start output wire). Vehicle specific, combination (2-In-1 Kit) data transponder key�bypass and doorlocks interface module programmable for over 3400 different year, makes & model of vehicles including vehicle's with Push-to-Start ignition's. Features include pre-flashed vehicle specfic firmware and single-wire connection to any remote start system�equipped with a 'DBI' port (also compatible to any remote starter system�without a DBI port but�with a negative active out�during remote start output wire).